This was Herod Antipas, the Tetrarch of Galilee, the son of Herod the Great. This man had a lawful wife, the daughter of Arethas (or Aretas), the King of Arabia (that is, Arabia Petraea, which had the famous Nabatean stone city of Petra as its capital. This is the Aretas mentioned by Saint Paul in II Cor. 11:32). Without any cause, and against every commandment of the Law, he put her away and took to himself Herodias, the wife of his brother Philip, to whom Herodias had borne a daughter, Salome. He would not desist from this unlawful union even when John, the preacher of repentance, the bold and austere accuser of the lawless, censured him and told him, "It is not lawful for thee to have thy brother's wife" (Mark 6: 18). Thus Herod, besides his other unholy acts, added yet this, that he apprehended John and shut him in prison; and perhaps he would have killed him straightway, had he not feared the people, who had extreme reverence for John. Certainly, in the beginning, he himself had great reverence for this just and holy man. But finally, being pierced with the sting of a mad lust for the woman Herodias, he laid his defiled hands on the teacher of purity on the very day he was celebrating his birthday. When Salome, Herodias' daughter, had danced in order to please him and those who were supping with him, he promised her -- with an oath more foolish than any foolishness -- that he would give her anything she asked, even unto the half of his kingdom. And she, consulting with her mother, straightway asked for the head of John the Baptist in a charger. Hence this transgressor of the Law, preferring his lawless oath above the precepts of the Law, fulfilled this godless promise and filled his loathsome banquet with the blood of the Prophet. So it was that that all-venerable head, revered by the Angels, was given as a prize for an abominable dance, and became the plaything of the dissolute daughter of a debauched mother. As for the body of the divine Baptist, it was taken up by his disciples and placed in a tomb (Mark 6: 21 - 29). Concerning the finding of his holy head, see February 24 and May 25. The glorious beheading of the Forerunner was a certain divine dispensation, that the coming of the Saviour might also be preached to those in Hades. Let Herodias lament, then, that she demanded a wicked murder; for she loved not the Law of God, nor eternal life, but one false and fleeting. 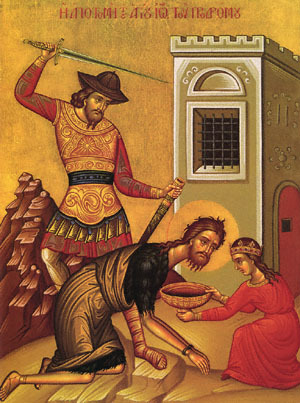 Share the feast of Beheading of the Holy and Glorious Prophet, Forerunner and Baptist John with an icon greeting ecard.